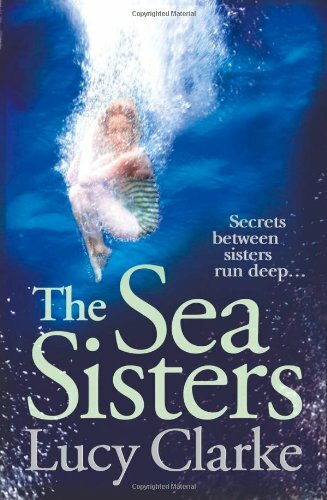 As any writer knows, one of the best ways to improve your writing skills is to read and one particular novel I’ve thoroughly enjoyed recently is Sea Sisters by Lucy Clarke. Not only is it another fabulous pick from the Richard and Judy Book Club but it’s also a book that was originally spotted by my editor Sarah Ritherdon at HarperCollins who also acquired my book Yesterday’s Sun…another Richard and Judy selection. So while I immersed myself in the lives of the Sea Sisters, at the back of my mind I was also marvelling at my own good fortune. As I considered what it was about this novel that caught Richard and Judy’s eye, I couldn’t help wondering what it was that caught their attention in my book. What I do know is it was very exciting time in my life and one I’ll never forget. Yesterday’s Sun was selected for the Spring 2012 list but it was in October 2011 when I first heard the news. I had finished work (my day job) early because HarperCollins had arranged for some photos to be taken for my author profile. The photographer was lovely but it wasn’t a particularly pleasant experience for me trying to look comfortable in front of a camera. I’d switched off my phone so it was only when I left the studio that I noticed a missed call from Sarah. I was walking through Cavern Walks in Liverpool laden down with the outfits I’d taken for the photo shoot when I phoned her back. She was delirious with excitement and at first I wasn’t quite sure what she was telling me. It took a while for the news to sink in but when it did I sank down onto some nearby stone steps. You know how you try to talk quietly when you’re on the phone in a public place? Well not me, not that day. It didn’t take long before I was just as excited as Sarah, tears were in my eyes but I couldn’t stop grinning even when passersby looked at me with mild curiosity. Next I phoned my agent Luigi Bonomi, who already knew of course, but the excitement was contagious. And after that? Well…nothing. I wasn’t allowed to tell anyone else!! It was top secret and there was a veiled threat that if the news leaked out then I could be taken off the Richard and Judy list. So what did I do? I went to the supermarket and bought a bottle of champagne and then rushed home to my daughter who was the only other person I was allowed to tell. And what was the response of my sixteen year old daughter? ‘Who are Richard and Judy?’ Sorry Richard. Sorry Judy. I cannot even begin to explain how frustrating it was not being able to tell people. I suppose the only good thing was that at this point my writing career had barely started and I didn’t have this blog; I wasn’t on twitter; and I didn’t have an author page on Facebook so the only real temptations were with family and friends. The list was going to be announced on 5th January 2012 and I have to say I was pretty good at keeping the secret although by Christmas I was whispering the news to my family, swearing them to secrecy. Not that they did. When I told my brother Jon he grinned sheepishly, my mum had already told him. The first time I saw my book on sale was in WH Smiths on the Richard and Judy stand. It was the day before publication so I hadn’t expected to see it. I was on my own and I stood there transfixed. My hand trembled as I picked it up, still not quite believing my book had been published and then quietly I put it back on the shelf. How I stopped myself from grabbing the nearest unsuspecting customer and pointing at it I’ll never know. But the highlight of the whole experience had to be being interviewed by Richard and Judy for their website. They were filming a series of interviews with some of the authors on the Spring list and we all gathered in what had been set up as the green room before being ushered in to be interviewed. Jojo Moyes was there and said not to worry about the interview as she’d heard how experienced interviewers like Richard and Judy didn’t let their interviewees fail, they would look after us and they did. Not that I can tell you much about the end result. I still haven’t watched the interview…but click here it is if you want to take a peak.